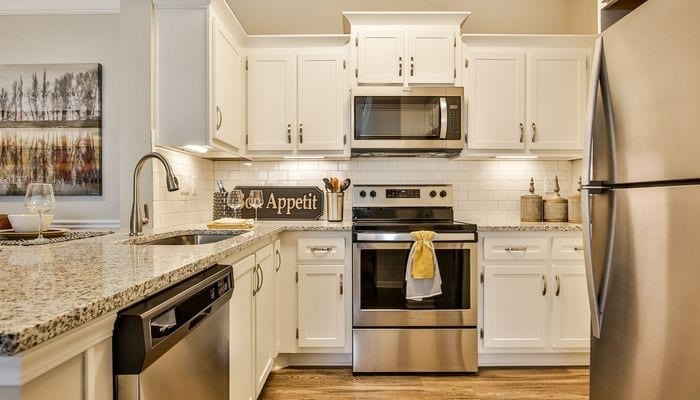 Granite Countertops, Glass Stovetops and Stainless Steel Appliances, OH MY! Settling into your newly renovated apartment and loving it? Granite countertops, glass top stove and stainless-steel appliances are super easy to maintain BUT they ARE different than what you may be used to. Here are some easy tips and tricks to keep your counters spotless and your appliances smudge-free! The easiest way to keep your stone looking great is to avoid bad habits that may damage it. Acidic substances like wine, coffee, fruit juices, tomato sauce, and sodas could potentially stain the surface. Cooking oils may also leave a stain if not wiped up. Using a specially formulated natural stone and granite cleaner is recommended to keep your countertops in the best condition while also protecting the sealer. However, hot water will do for quick clean-ups. Dish soap won't permanently damage your granite, but repeated use of soapy water will cause build-up (yes, even if you rinse) and dull your countertop's shine. So, regularly using dish soap for cleaning granite countertops is not recommended. Again, granite won't etch and using coasters is not an absolute necessity, but using coasters is just a good practice to protect all bath and kitchen countertop surfaces. Yes, you can take a hot pot off the stove and put it right on granite countertops without any problems. It is possible for granite to suffer "thermal shock" and crack, but rare. You don't want to put hot pans on any other surface except for soapstone. But you must consider other issues as well... Grit that gets trapped between the pot and the countertop surface may scratch the surface--even granite countertops. Granite is very hard and durable and can take tons of abuse without any significant damage, but it can develop light surface scratches or pitting in high-use areas around the sink and cooktop. It is not common, but it is possible. And ALL other surfaces are softer than granite. Better safe than sorry. Also, once you remove the hot pan from the countertop, the surface will be very hot and may burn. Again, avoid the possibility of scratching the solid surface and protect your knives. Cutting on the stone will dull and damage your knives' edges quickly. You should never use your granite counter as a cutting board. Generic cleaning products including bleach, glass cleaners, and other degreasers and common household cleaners that you buy at your local store contain acids, alkalis, and other chemicals that will degrade the granite sealer leaving the stone more vulnerable to staining. You can get an affordable cleaner Weiman Granite Cleaner & Polish like this for less than $4 at Walmart. Most common and name-brand household products are not suitable for cleaning granite countertops. It is best to avoid using anything that isn’t specifically recommended for granite. Simply use warm water and a soft cloth, if nothing else. Avoid ammonia-based cleaners and vinegar. The powders and even the "soft" creams contain abrasives that will scratch and dull surfaces. Unlike a laminate countertop surface, granite, marble and quartz solid surface countertops are very hard, but not flexible. Additionally, they DO NOT have a plywood backing, so when too much weight is applied in one spot, it could cause a crack. Cooking oils, hair products, perfumes, colognes, nail products, creams, lotions, and potions tend to spill or leak and often go overlooked. Even when sealed, a substance that remains on the granite surface for an extended period may stain the granite. Practice proactive granite countertop care by storing these products on a shelf or decorative tray like they do in fancy hotels! Let’s face it—glass-top stoves can be hard to keep clean without routine maintenance, but we love the extra counter space they can provide as well as the sleek look and usual easy wipe down. A few drops of water spilled while cooking can create crusty halos around your burner that won’t simply wipe away clean. Burn marks can build up over time until your stove constantly looks dirty. It’s a frustration we all share. Thankfully, there’s a solution—and it’s an easy one. You can use a mixture of white vinegar (to remove the grease) and then baking soda to rub away caked on stains. Bon Ami powdered cleanser (easily found at any grocery or super store) is another great option. Because a ceramic glass top stove isn’t coated in another material (like a window or mirror is), it’s okay to use a mild abrasive cleaner like Bon Ami or baking soda to remove residue and stains. To make your glass stovetop look new in minutes, first wipe it down with a wet cloth. You can wipe it with white vinegar to remove grease. Then, sprinkle the surface with Bon Ami powder cleanser or the baking soda and give it a good scrub with a soft cloth or the soft side of a sponge. If the stain doesn’t rub away at first, apply more Bon Ami and continue working it until it disappears. Please note: the cleaning of a glass-ceramic cooktop should be uninterrupted; with plenty of water used to keep the surface moist. All the cleaning solution, including any residue, should be completely removed from the surface once cleaning is completed. Bon Ami, or any cleaner, should not be left in contact with the cooktop for an extended period of time. When all the stains have been rubbed away, wipe the surface clean using a wet cloth. For a streak-free shine, dry the surface using a clean, dry cloth. To get your stainless steel appliances shining like new, you’ll need to invest in some microfiber cloths. These super-soft, non-abrasive cloths will last you a long time — especially since you can throw ’em in the wash and reuse them! You’ll also need white vinegar (in a spray bottle, preferably), paper towels and mineral oil like olive oil. 1. Gather your supplies: This task (and most others!) will be so much easier if have all of your supplies collected and ready to go. 2. Determine the direction of the grain: I know that we usually reserve the term “grain” for wood; however, stainless steel also has a grain. Look closely. It will either be running horizontally or vertically. To clean your stainless steel, rub in the direction of that grain. 3. Do a preliminary clean of your appliance with vinegar: Spray your appliance liberally with vinegar. 4. Wipe it down: Using either a paper towel or a very soft cloth, wipe the vinegar off in the direction of the grain. This should remove the initial debris from your appliance and start to shine it up a bit. 5. Dip your soft cloth into a little bit of oil: You don’t need a ton, as you can always come back for more. 6. Polish your appliance: With your oiled-up cloth, wipe in the direction of the grain. You will start to see all of the marks disappear! Now you have a shiny new appliance again! You can also purchase a pretty inexpensive Stainless Steel cleaner from the store but it should always be a two-step process, one that cleans, and one that buffs or shines. There you have it! All of the easy tips and tricks you’ll need to keep your newly renovated apartment looking like new!!! Enjoy!